Captain Jess Fishlock says Wales' next two Women's World Cup Qualifiers will be crucial in their bid to reach the 2015 finals. Fishlock scored a hat-trick in the 4-0 win over Montenegro and they face games against Turkey and Belarus in June. Wales remain five points behind leaders England but the Seattle Reign player says finishing top of the group is still achievable. "We have a massive [double] header next month," she said. "If we pick up six points there we go into our last two games in August and September with absolute every single thing to play for - not just to come second but to come first. "We've lost one game against England and we have the players to upset them. "I believe that 100% but we've got to stay focused now and get the results we need next month and that's the most important thing for us." 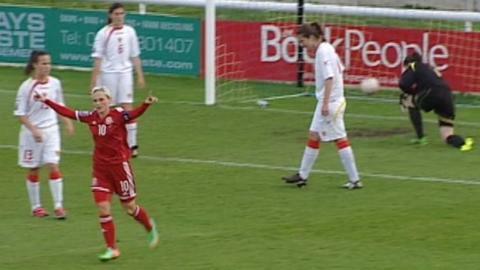 Fishlock's in the comfortable 4-0 win over Montenegro in Bangor to keep their hopes of catching Group 6 leaders England. Mark Sampson's side maintained their 100% record in the group with a 4-0 win over third-placed Ukraine, who are now six points behind Wales but with two games in hand. "I felt that England were always going to bear Ukraine," Fishlock added. "Ukraine are a good side but I think England are just a level above. "But for us we've just got to focus on us. We've got four games left."